I have been looking through myArmoury's 16th century album on Facebook, and this caught my eye. 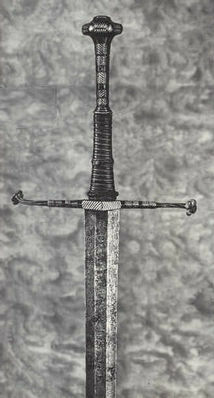 (The photo below is the same sword, but hosted on this site rather than Facebook.) Is there a photo anywhere that shows the entire blade? The grind on the blade has me intrigued, and of course the hilt is amazing as well. Would this be considered a type XVII I guess? It appears to be hollow-ground, and the weight is less than I would have thought for that type after reading Oakeshott. From the description in the Facebook album: "Overall length: 1210 mm (47.64"), Blade length: 960 mm (37.8"), Blade width: 47 mm (1.85"), Guard length: 248 mm (9.76"), Weight: 1420 grams (3.13 pounds); W 910 (AB 7444)"
I have wanted more photos of this antique for some time. I have messaged the museum that houses it and asked for additional higher resolution images but never have received a response. It looks like a Type XVII to me but sure would like to see the entire sword.